Vampire/Werewolf, Autistic, Christian, Business Admin, 24, and female. I do battle. Send a request. I hoard Vevillions!! Thank you, LawofLuffy for helping lend money for my pokeradar. LuckyBonsaiTree hasn't collected any medals so far. want a chance to win shinies or gems- including dragon gems every two weeks? then Vote!! in Professor*Acacia's poll! Vote in her Bi-Weekly Lottery and PRIVATE MESSAGE her your answer, you get one ticket. send her fairy gems, you get three tickets per gem! Send her Ice, Normal, Flying, or Electric gems and get 5 tickets per gem! Be sure to include the hashtag in the message for Delibird! Swim practice was amazing. So ready for competition. I would like a Toyhou.se code please. I want to join to show off my art obtained there. 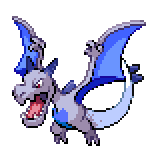 Can anyone do me a sprite of a pokemon? Want art so badly. PM me the price and see if it is agreeable with my budget on here. I want an Raichu (Alolan) so badly. That is the one thing on my wishlist. I have a sale uft box. PM if you want anything. It is pay what you want but not free. Hey guys! I have to beat Professor Oak. Share this post with the tag #Cassieslab to have a chance to win 250,000 PD. If I manage to beat Professor Oak by Sunday at 8 AM then I'll raffle off the 250k with whoever shared the tag! Goal: Working hard on getting Dragon Gems and Gems needed for a Yveltal or a Xerneas.